The first few puzzles start with classic sliding block mechanics, but the game immediately shows its originality with its choice of the goal. In this kind of games, you usually have to "free" a piece so that it can slide out of the board, or simply have to put the pieces in some predefined order. In Shapist, instead, you have to move the pieces away from a gray rectangle, which represents a door. 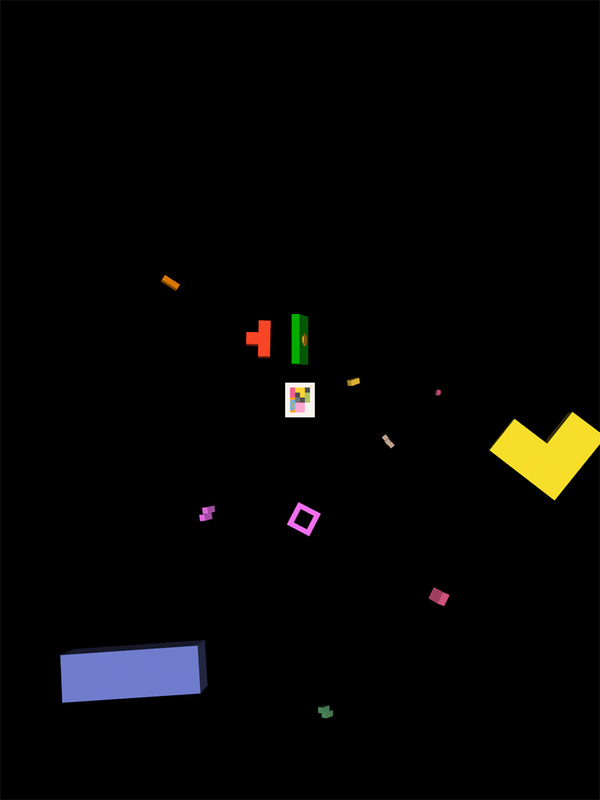 When the rectangle is completely uncovered, the door opens and you fly through it to reach the next puzzle. One thing that soon becomes apparent is that the pieces don't move "on rails", but attempt to model physical properties so that they e.g. bounce against a wall if you throw them fast enough, and you can move multiple pieces at once by pushing them against each other. This isn't a very common feature, but it isn't unique either: for example, Grabarchuk puzzles has apps with similar behaviour. To be honest, I don't think the physics simulation is accurate enough to be believable, and actually more often than not the pieces seem to behave in odd ways, especially if you try to move them quickly. This isn't a major issue, however. As you would expect, opposite poles attract each other, and equal poles repel each other. You can put two opposite magnets next to each other, but you need to keep them together using other pieces and the walls, otherwise they will move away. Also, when two magnets are joined you need some free space to separate them. Springs can be compressed and they will retain the compressed size for a few seconds, then extend again. Like magnets, to make them stay compressed you need to wedge them between other pieces and the walls. Frankly, in some of the puzzles the springs seem to have been added only because the engine supported them: they are just an annoyance because you need to compress them time and time again, but they don't provide an additional obstacle to the solution. In a few cases, they are a real part of the puzzle because it's not obvious how to keep them compressed while opening the door. Rotating a piece is harder than you might think, because you don't just make it turn by 90 degrees at a time like in many other games: you need to have enough free space around the piece while it rotates. I'm not going to explain what the last special piece does, because figuring out how to interact with it is fun in itself. Suffice to say that it will force you to look at the puzzles from a different angle. And actually, talking about angles, some of the late puzzles even have a rotated exit door! Clever idea. There are about 50 puzzles in the game, and there is no time wasted in simple stuff either: the puzzles become fairly challenging right from the start, difficult enough to keep even an expert player interested, but not excessively hard. Usually you can do a good use of logic deductions to figure out what kind of moves are impossible (like swapping two large pieces) so that whatever remains, however improbable, must be the truth. I got stuck many times, and putting the game aside for a while and coming back to it with a fresh mind helped getting past the hurdles. I found it annoying that if you quit the game, the current puzzle is reset instead of remembering the position where you left it. I appreciated that some of the puzzles are not simply a matter of sliding the pieces around, but also need some more clever trick to reach the solution, requiring the player to think out of the box (sometimes literally). The great limit of this game is the user interface. For some reason, even if it is currently only available for iPad (apart from a browser demo), it seems to have been designed to be used with a mouse. It requires good precision to pick up the pieces, which results in missed moves if you try to play more casually, but most importantly it only supports single touches for all interactions. This is a shame because many things feel counterintuitive. For example, often you'd want a magnet to stay still while you slide another piece beside it to keep it in place. You'd be tempted to hold the magnet with one finger and slide the other piece with another finger, but that doesn't work; instead, you just have to rely on some (very short!) delay built into the engine. Another example is compressing springs: you'd expect to be able to pinch them with two fingers, but instead you have to use just one finger and push them against another object. Similarly, it would seem natural to separate two magnets by spreading them apart with two fingers, but instead you have to double tap them. The most annoying example is the rotating pieces. Instead of the widely accepted two fingers gesture, you have to grab the piece by one corner and drag it around to make it turn. The list of puzzles is also painful to navigate quickly, and often stops altogether if you try to scroll it quickly. Despite the shortcomings in the user interface, I recommend this game because the puzzles are challenging and interesting, and I had good fun solving all of them.